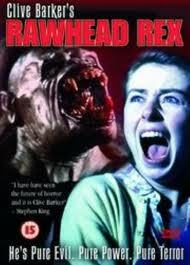 Rawhead Rex…the Clive Barker monster movie! The 1986 flick Rawhead Rex ranks up there with Q: The Winged Serpent as one of the most awesome cheesy monster movies of the 80s! It may be written by Clive Barker, but that doesn’t stop it from being fun. Just ignore the storyline involving religion, otherworldly demons, and ancient times, because Rawhead Rex is really just a slasher starring a monster. In a nutshell, this big phallic rock gets hit by lightning and unearths Rawhead Rex, a man in a gnarly looking rubber mask with glowing red eyes. Hell, the mouth doesn’t even move, even though Rex is a carnivore. He begins to terrorize the people of Ireland, mostly the locals in a trailer park. There’s also some dude who’s come to Ireland with his family to write a book and has a distinct interest in the church near which Rex came out of the ground. 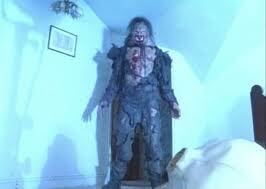 Thankfully, there’s nothing too deep or Barker-esque about the plot of Rawhead Rex to weigh it down. Rex just goes around killing people with no rhyme or reason. The fact that he can come into someone’s house and destroy their kitchen is pretty terrifying. He hides out in the woods, where he hangs his victims from trees and then noshes on them. And he likes to tip trailer homes. Conveniently, pulling a chick out of a trailer results in her dress being completely torn off. Ah, the 80s…. 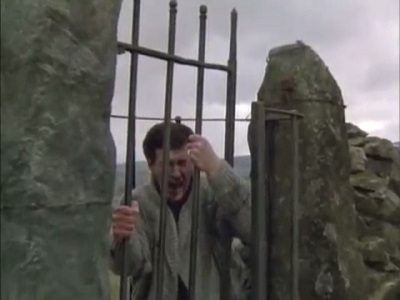 Through the magic of 80s special effects, the writer’s wife uses a stone statue to transmit amazing laser lightning bolts that take FOREVER to vanquish Rex. But does she really vanquish him? We close with that typical 80s moment when the monster inexplicably pops up in the final frame. This entry was posted in Living in the 80s - forever, Movie Times & Television Schedules - Staying Entertained, The Evil of the Thriller - Everything Horror and tagged 1980s, 80s, Clive Barker, creature feature, Rawhead Rex. Bookmark the permalink. 3 Responses to Rawhead Rex…the Clive Barker monster movie!